We’ve said it before and we’ll say it again, kids today have it too good. 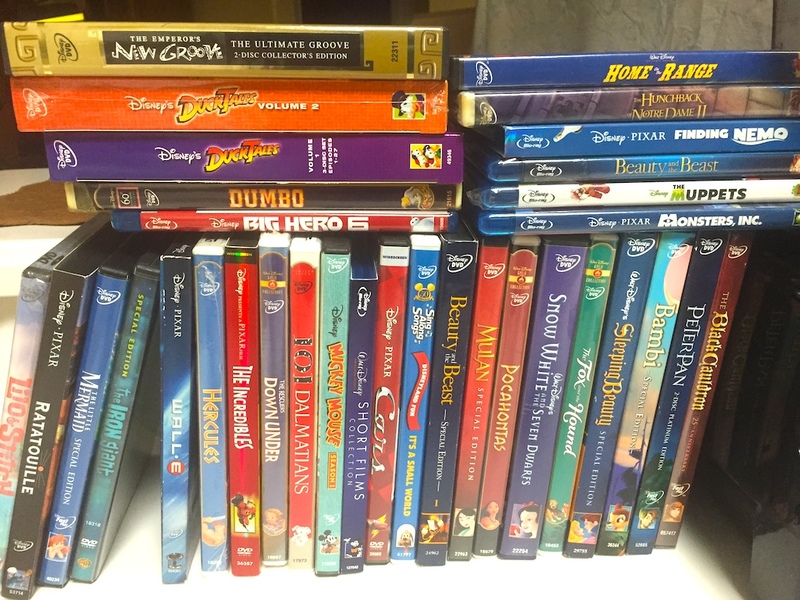 The overall quality of animated films today is higher that it has ever been, many of which (Up, Toy Story 3, How to Train Your Dragon) are as good as any live action film. But believe it or not there was a time when animated films weren’t doing all that well at the box office, including the ones made by Disney. In the mid ’80s we were at the nadir of the animated film industry, but that all changed in 1989 with the debut of The Little Mermaid. A smash success with a crowd pleasing soundtrack, Mermaid was so popular that fans wanted an attraction based on the ride 20 years after the movie came out. No offense to Big Hero 6 or Wreck It Ralph – both of which were awesome movies – but do you really see fans in a fever pitch to get attractions based on them 20 years from now? 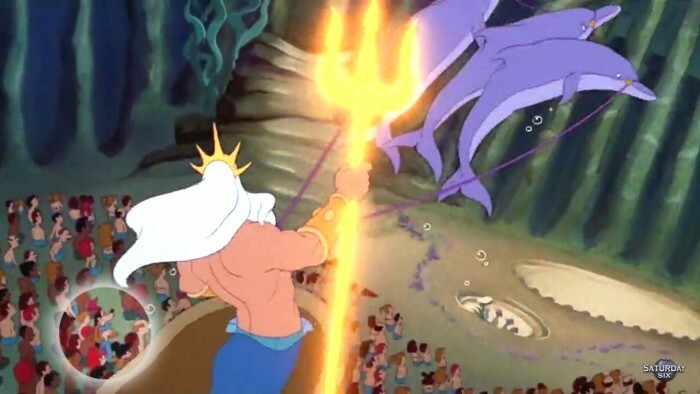 After watching Mermaid approximately 1,000,000 times on VHS (and DVD, and blu ray, and now digitally on our iPhone) you start to catch every little detail in the film, such as the Big Three of Goofy, Mickey Mouse, and Donald Duck among the crowd that King Triton glides by near the beginning of the film. There also looks to be a mermaid wearing a pair of Mickey Ears in the bottom right of the screen. King Triton glides by the Big Three. Another one of our favorite movies is Aladdin, and it has a very easy to catch Easter Egg featuring a character from The Little Mermaid when Genie pulls Sebastian the crab out. Now the movie draws attention to this with a small riff on the Under the Sea song, so it’s definitely something the filmmakers wanted the audiences to catch (along with the hilarious Pinocchio reference). 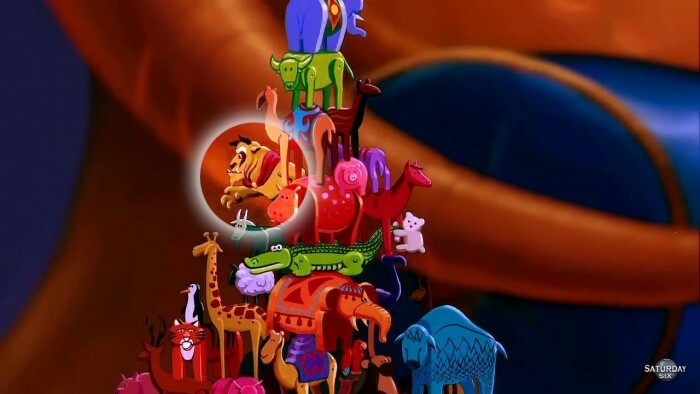 Later in the film there is a much harder reference to catch, and it is hidden in the tower of animal figures that the Sultan is stacking upon each other. If you look closely on the left hand side you will see none other than the Beast from Beauty and the Beast. The Beast from Beauty & The Beast. 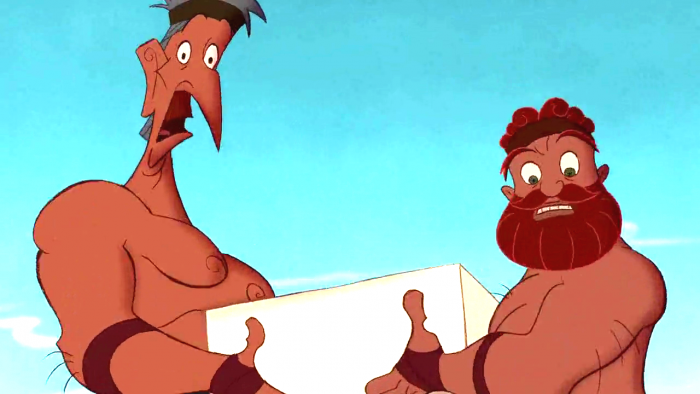 Here is one type of Easter Egg that no one would notice unless you really knew your Disney animated films (much like the Ratigan/Ron W Miller reference). It’s one thing to recognize famous Disney characters, or celebrities like Jack Nicholson (who was referenced in Aladdin), but a Disney animator? The under-appreciated Hercules was co-directed by John Musker and Ron Clements, and they appear in the film itself as two workers building an arch that young Hercules barrels into early in the film. 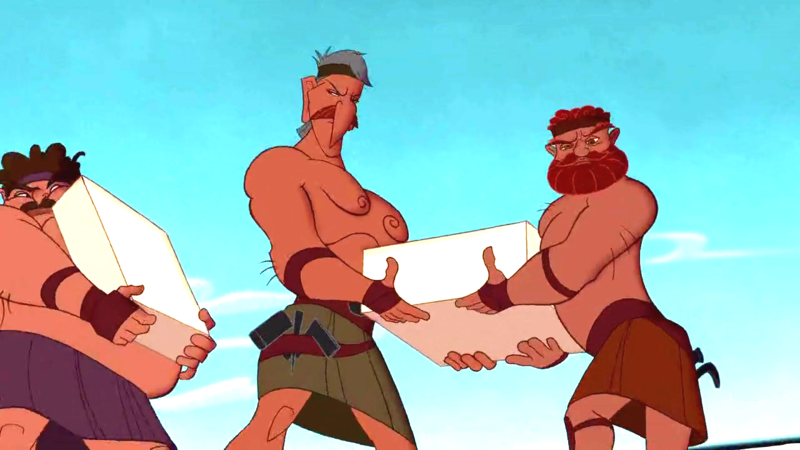 Animators putting themselves (or friends and family) in movies is nothing new, and certainly similar to things we have seen Imagineers do in our favorite Disney attractions. 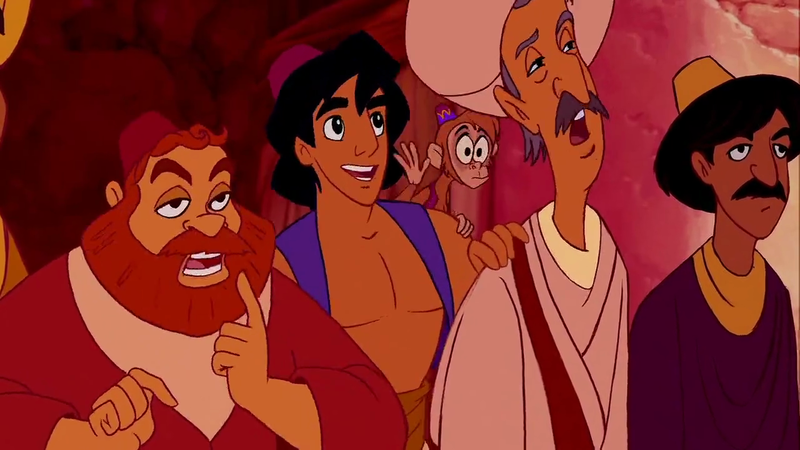 Speaking of Clements and Musker, they also co-directed Aladdin and can be seen as members of the crowd in the “Another suitor for the princess” scene. 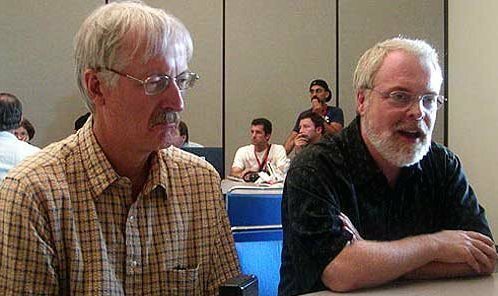 Ron Clements and John Muskers, the co-directors of Aladdin. Have you heard of a little film called Frozen? Don’t feel bad if you haven’t, Disney’s marketing arm apparently let this one slip by almost unnoticed. However, for those of you who have seen the film, it does contain a very quick cameo by two of our favorite heroes from Tangled. During the song For the First Time in Forever, after Anna opens up the gates we see her run past several guests coming to see the coronation. Two of these guests are Rapunzel (with her hairstyle from the end of the film) and Eugene Fitzherbert (Flynn Rider). If there is anything the Marvel Cinematic Universe has taught us it’s that we love a shared universe, and the concept of one Disney princess crossing over into another’s “realm” opens up some really neat ideas that Disney can explore in the future. Is that Rapunzel in Arendelle? Another great Easter Egg in Frozen is hidden deep into the ending credits of the movie. Earlier in the film Kristoff tells Anna that all men pick their nose and eat their own boogers. Well, the credits have a fantastic disclaimer saying that the views and opinions expressed by Kristoff are not shared by the filmmakers or the Walt Disney Company. Now that is a great touch. You’ll also notice in this photo a section of names under “Production Babies.” This seems to be a credit listing only seen in some animated films, and refers to children that were born to anyone working on the movie during the production. 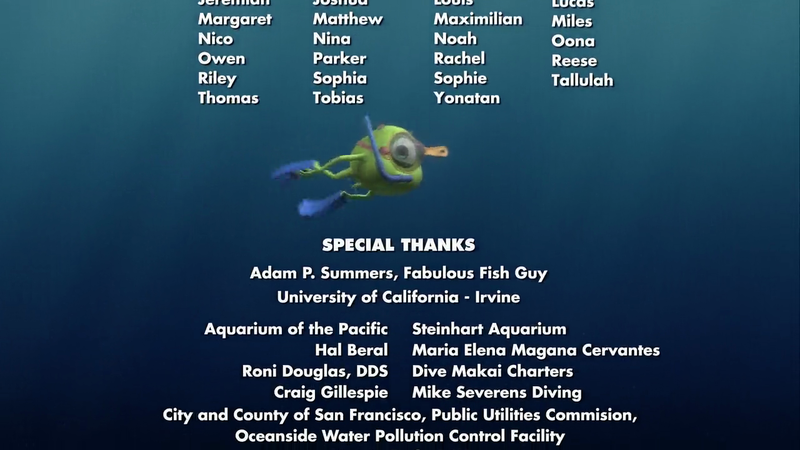 Since we are on the subject of credits, no one makes watching credits more tolerable enjoyable than Pixar. In fact with Toy Story, Pixar created something new by having a set of credit “bloopers” be added on to the film after its release. It was an ingenious attempt to get people to go back and see the movie again. All Pixar films have end credits worth watching, but one of our favorites is Finding Nemo. 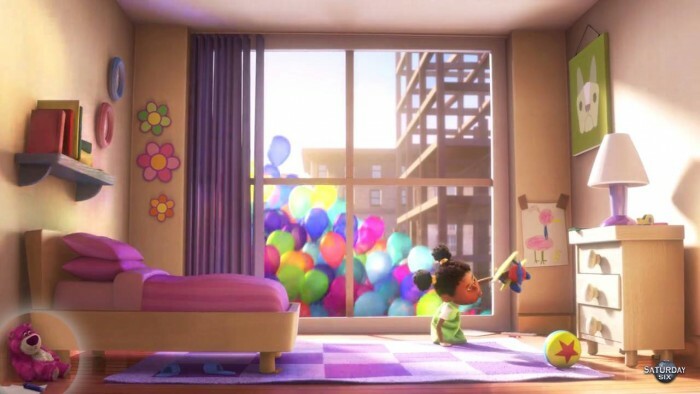 Not only do you get brief appearances by all the major characters in the film, including our personal favorite – Peach the starfish – but there’s even a cameo by Monsters, Inc.‘s Mike Wazowski. Mike Wazowski in snorkle gear, swimming by during the “Production Babies” listing. 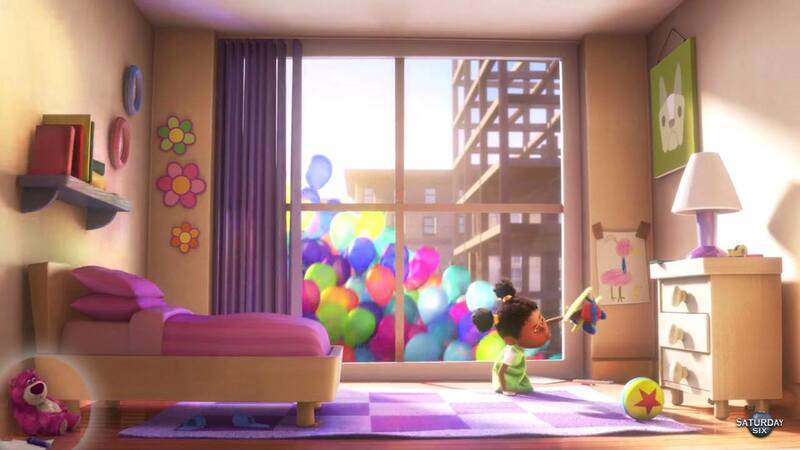 Besides great credit sequences, Pixar films are loaded with Easter Eggs. Another one of our favorites was The Incredibles comic book being read by a little boy in the dentist’s waiting room. We love The Incredibles, and we really love comic books, so the two combined together? Step aside chocolate and peanut butter! A Mr. Incredible comic? That’s something that could get me to go to the dentist! Now Monsters, Inc. came out two years before Finding Nemo, so there was an established fondness for Mike Wazowski, but The Incredibles came out a year later. No one could have possibly known who Mr. 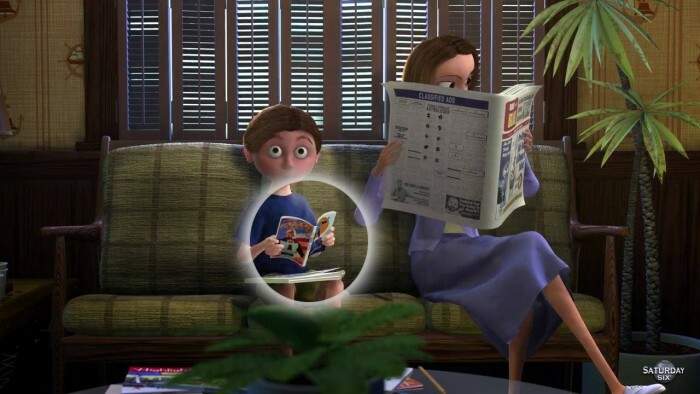 Incredible was when seeing the film, but it was a great Easter Egg put in by Pixar for their loyal fans. In fact Pixar has a long history of putting characters in a movie from an upcoming film. Dug (from 2009’s Up) has his shadow appear in 2007’s Ratatouille. That’s Lotso the Bear from 2010’s Toy Story 3 making an appearance in 2009’s Up. 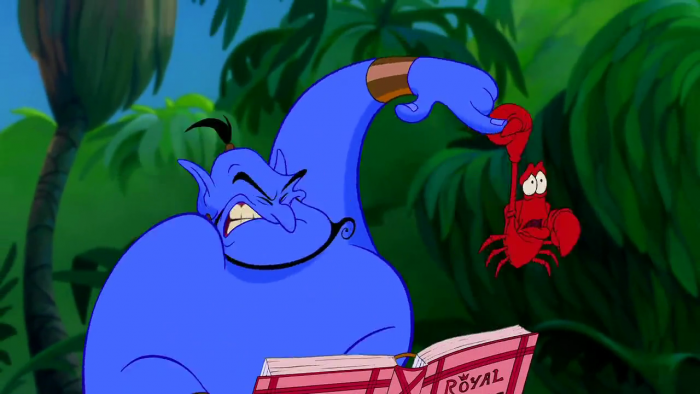 As good as Pixar is at Easter Eggs, there’s one movie that may have them beat. Wreck It Ralph not only has a lot of great Disney cameos, but it also has a ton from the world of video gaming. 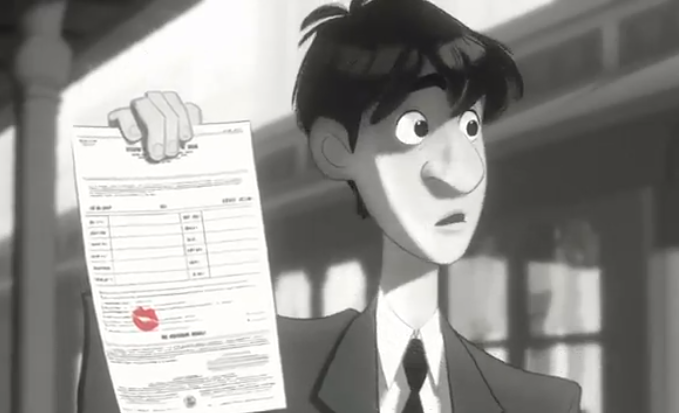 We’re going to spotlight our two favorites from the world of Disney animation though, and the first once references Paperman, the Academy Award winning short that played in front of Ralph at the theaters. During the beginning of the film, when Ralph is at his Bad-Anon meeting, you’ll see a piece of paper on the memo board that is very similar to one used to great effect in Paperman. Bad-Anon meeting in Wreck It Ralph. 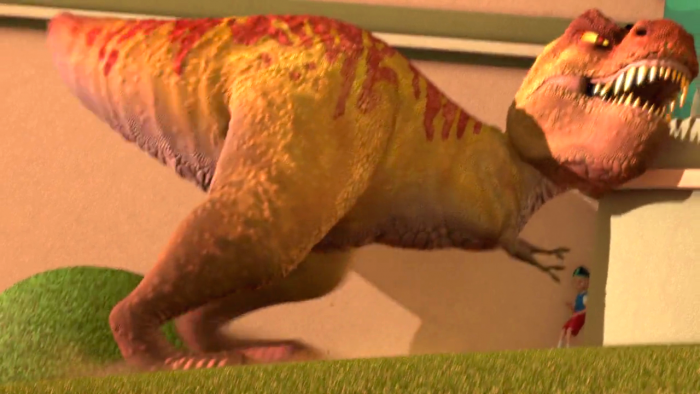 Our other favorite Easter Egg uses a character from one of the most criminally underrated Disney movies, Meet The Robinsons. One of the more memorable characters in that movie was Tiny the T-Rex. After Ralph leaves his Bad-Anon meeting he travels into Game Central Station, and among the many characters roaming this huge area is Tiny the T-Rex. Game Central Station, and if you look closely you just may see a character from Tangled. Game Central Station and a better view of Tiny. Don’t feel bad if you never noticed, this was during the moment when Sonic the Hedgehog appeared to deliver one of the major “rules” of the Universe and most eyes were on him. Someone has a big head (but tiny arms) in Meet the Robinsons. 1/10th of THE HOARD. Not sure how The Iron Giant got in there but I can assure you it is as good as ANY Disney/Pixar film and comes HIGHLY recommended. Special Thanks to crack staff photographer Brandon Glover, Master photo manipulator Matt Cleary, and blogger to the stars Megan Stump for their invaluable assistance with this article. Be sure to also check out Brandon on The Park Blogger podcast with co-hosts Aengus Mackenzie and Brian Carey. Meet the Robinsons deserves every accolade. Truly an undiscovered gem. You could devote a column–a top 100! 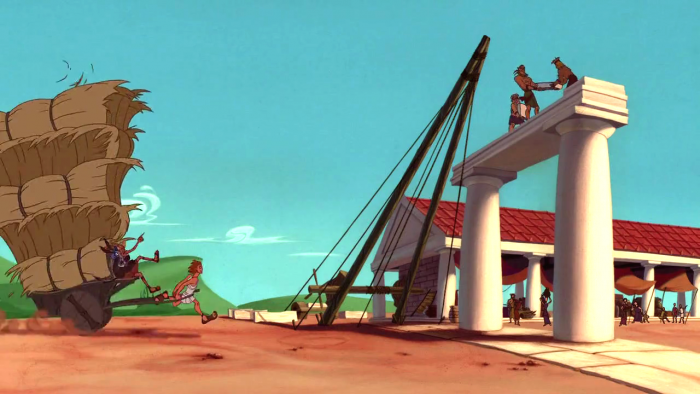 of the hidden references in Who Framed Roger Rabbit, too. Thank you for an entertaining Saturday morning read, as always. Loved reading this! Also, in Little Mermaid, the same scene right by the Mickey ears is Kermit the frog! I found it on the 10,000th viewing of the movie months ago, lol. Mildly NSFW if you have hawk like vision. I think Derek was trying to keep the article family friendly. Otherwise he would have included the phallus hidden in the castle on the cover of the VHS version of “The Little Mermaid”. Thanks for another great 6.